As we prepare for our Intervention in the Trans Mountain expansion/Kinder Morgan- National Energy Board hearings we are made aware of sources of the research that has been carried out for environmental assessment. 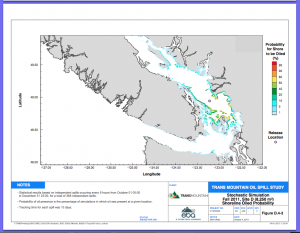 One set of documents is “13-12-16 Trans Mountain Pipeline ULC – Trans Mountain Expansion Project Volume 8C Part 3 (A56026)” This is available at https://docs.neb-one.gc.ca/ll-eng/llisapi.dll?func=ll&objId=2393350&objAction=browse&viewType=1 I have provided here an example of the type information available . 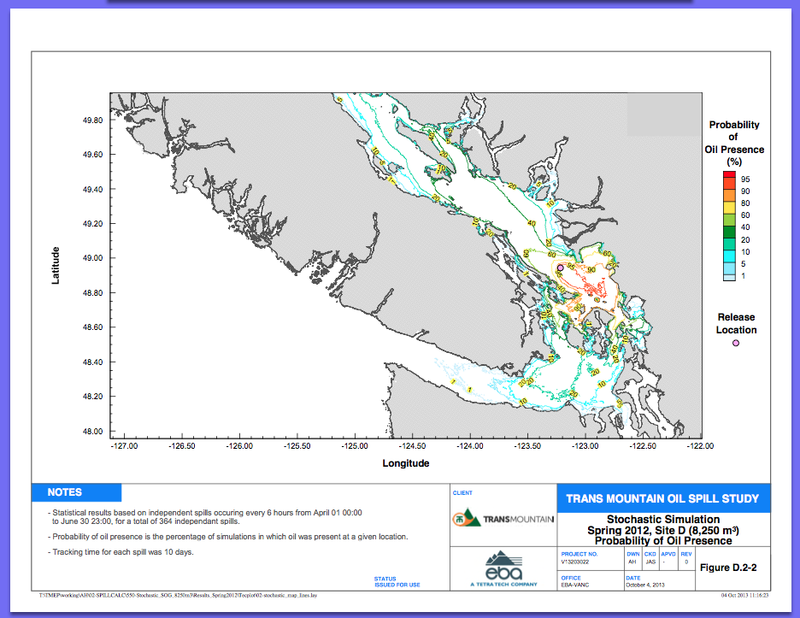 The first model links to the pdf of the effects of an oil spill at race Rocks Ecological reserve in the Strait of Juan de Fuca. 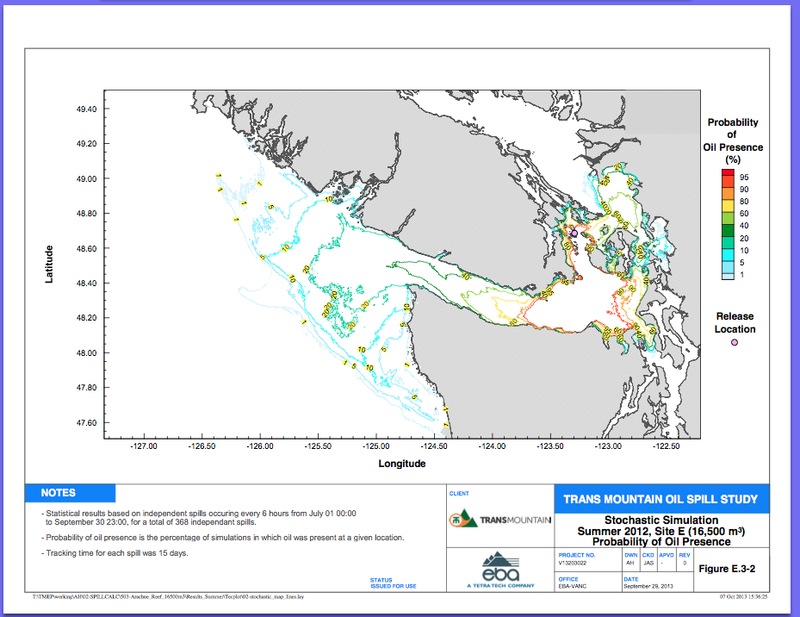 The next models below are based on a spill in one of the most dangerous pathways in the Haro Strait/ Boundary pass region , (Site E), South East of Victoria in the various seasons of the year. 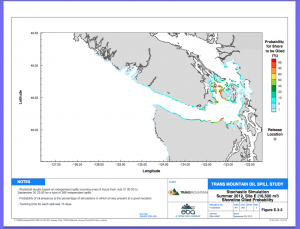 It is worth while taking a look at the other models for a spill at Hope and a spill in the middle of Georgia Strait, The weather conditions of those times will determine the fate of the oil spread and impact on the environment. These are just a sample of the graphs and charts provided for each site and for each season. 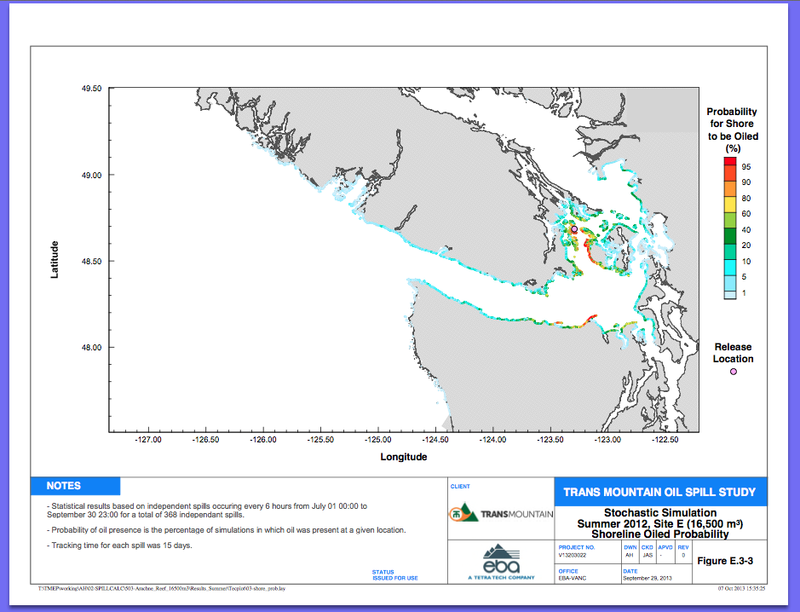 They are based on wind conditions present at the time of simulation. 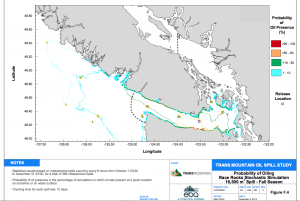 Note in the sample of maps below the vulnerability of our Marine Ecological reserves on the Coastline from Nanaimo to beyond Checlesset Bay Ecological Reserve. 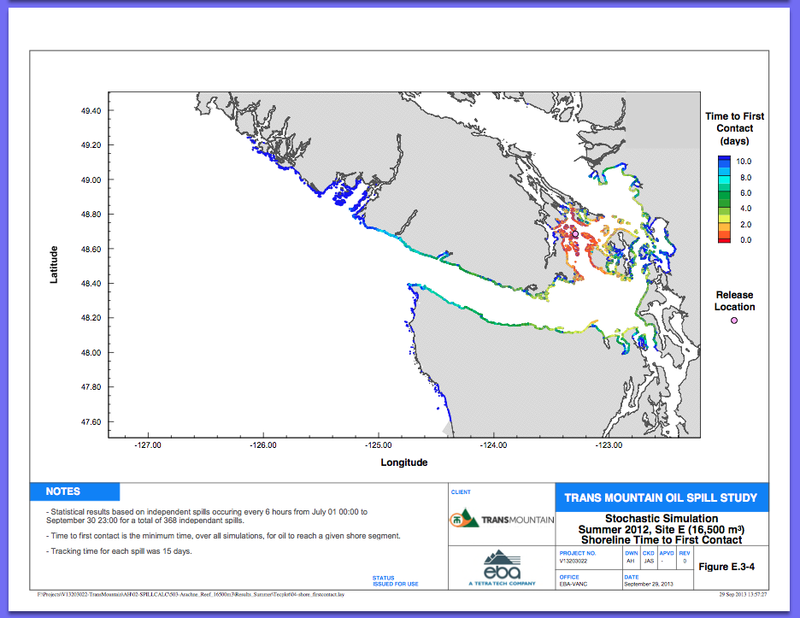 This is just one of the models of the spill scenario for Race Rocks. 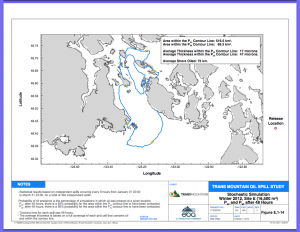 See others in the pdf link above. 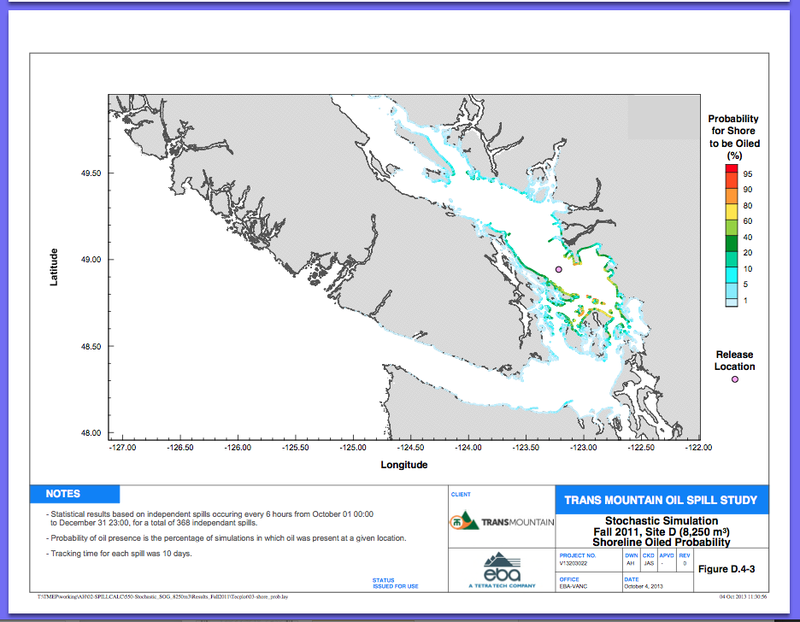 For an Oil spill in Haro Strait, in the summer, the time to reach parts of the Vancouver Island Coast is shown here. 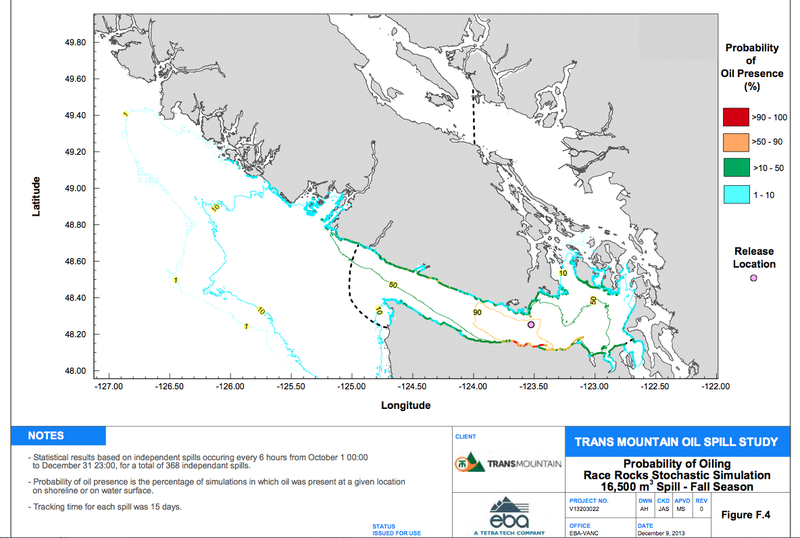 A spill at Site E at Haro Strait in the summer has a high probability of ending up on the shoreline around the District of Metchosin on southern Vancouver Island as well as the adjacent Race Rocks Ecological Reserve. 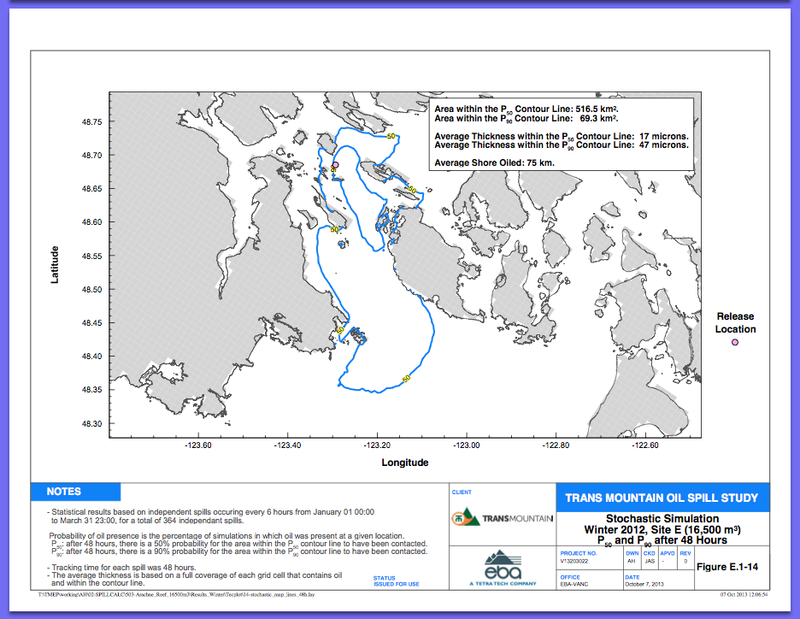 The thickness of oil spilled in Haro Strait in the winter.